Water resource plans are an integral part of implementing the Basin Plan. They set new rules on how much water can be taken from the system, ensuring the sustainable diversion limit is not exceeded over time. Basin state governments are developing water resource plans. The Murray–Darling Basin Authority is working closely with Basin state governments to ensure water resource plans meet the requirements of the Basin Plan and address the local requirements of water resource management. Each water resource plan sets out the rules for how water is used at a local or catchment level, including new limits on how much water can be taken from the system, how much water will be made available to the environment, and how water quality standards can be met. Basin state governments are responsible for complying with water resource plans and accounting for water taken from the river system. Water resource plans outline how each region aims to achieve community, environmental, economic and cultural outcomes and ensure that state water management rules meet the Basin Plan objectives. The plans reflect current arrangements that are working and include new arrangements that strengthen water management at a local level. Getting the plans right can take time—local communities must have confidence that the plans are robust, high quality and adequately address local needs. What's in a water resource plan? Water resource plans must be accredited by the Commonwealth Minister responsible for water. Basin state governments are responsible for developing plans and the Murray–Darling Basin Authority assesses the plans and provides advice for accreditation. The water resource plan accreditation process includes a number of stages, for Basin state governments, the Murray–Darling Basin Authority and the Commonwealth Minister responsible for water. Much of the critical work for water resource planning happens in the development stages where plans are developed in consultation with communities and the Murray–Darling Basin Authority to meet local water management needs and Basin Plan requirements. The timeframe to complete water resource plans was determined in 2012. Six years on, we have a better understanding of the complexities of water management. 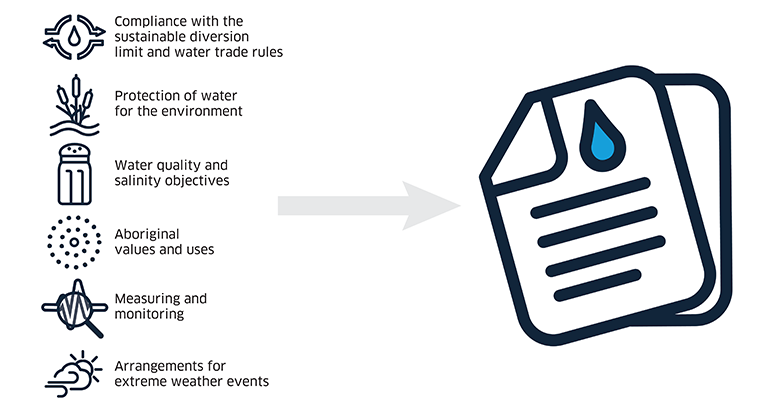 Plans for each area must consider a range of detailed policy requirements and address the local context of water resource management, on-the-ground – this can be challenging. The Commonwealth Minister responsible for water has granted timeframe extensions for some of the individual water resource plans. Information on extensions granted is published on the Australian Government Department of Agriculture and Water Resources website. In late 2018, new regulations were passed under the Water Act 2007 that enabled Basin state governments to request an extension for up to two or up to 10 months. This is in recognition of the need for quality plans to be prepared with adequate consultation with all stakeholders and the extensive number of plans yet to be accredited. Late last year the Murray–Darling Basin Ministerial Council were updated on WRPs and contingencies. They agreed key WRP commitments will be in place from 1 July 2019. Consistent with this Ministerial Council decision, Basin states and territory governments will enter into bilateral agreements with the Commonwealth to ensure key elements of the water resource plans are given effect from 1 July 2019 where WRPs are not accredited by that date. The agreements ensure that sustainable diversion limits and measures to protect and better manage environmental water are in place from 1 July 2019. MDBA and NSW signed a bilateral agreement in February 2019 to bring key Basin Plan commitments into effect from 1 July 2019. This agreement promotes transparency and gives the MDBA and the community confidence in the consistent application of key Basin Plan elements across all NSW catchments. Read the bilateral agreements. Basin governments are committed to ensuring stakeholders have the opportunity to comment on the development of the plans or state-based instruments that underpin a water resource plan. The introduction of a mechanism to manage necessary time extensions means the community can have confidence the plans will be robust, high quality and adequately reflect the local realities of water management. Importantly, all Basin States are working closely with the MDBA to ensure that the new limits, Sustainable Diversion Limits, and protections for environmental water will be in place from 1 July 2019 as planned, and key Basin Plan outcomes will be delivered. Managing water is complex. It depends on a partnership between the Australian Government, Basin state governments, and Basin communities. The Murray–Darling Basin Authority is working closely with Basin state governments, as they develop their water resource plans. This collaborative approach will make accreditation as efficient as possible. The MDBA will continue to report regularly on the progress of water resource plan development and accreditation, and we are further increasing transparency by publishing all water resource plans we receive for assessment. The Murray–Darling Basin Authority publishes quarterly reports that provide an in depth status of the progress of all water resource plans across the Basin. This webpage will be regularly updated to reflect water resource plan progress. Basin state governments have completed risk assessments, started planning and determined the process for seeking input from the Murray–Darling Basin Authority. Basin state governments have been consulting with local communities, water users and peak bodies to ensure local needs are considered in any changes to regional water management through water resource plans. This stage requires consultation with relevant Aboriginal Nations. Basin state governments provide draft water resource plan materials to the Murray–Darling Basin Authority for initial guidance and advice. Basin state governments formally submit their water resource plan package to the Murray–Darling Basin Authority to determine whether it meets the Basin Plan objectives. The Murray–Darling Basin Authority assesses the water resource plan and provides advice to the Commonwealth Minister responsible for water. Northern Basin Aboriginal Nations and Murray Lower Darling Rivers Indigenous Nations review the state's process of engagement with Aboriginal Nations and provide their assessment to the Murray–Darling Basin Authority. This advice is included in the package of advice that goes to the Commonwealth Minister responsible for water. The Commonwealth Minister responsible for water decides whether to accredit the water resource plan. Once accredited by the Minister, the plan is operational. The Murray–Darling Basin Authority’s role in assessing water resource plans is explained further in the water resource plan assessment framework.